Here’s what’s cooking – yum. Anything Jodi is making, we would gladly eat. We love her blog and are so happy to have her contributing to the Get Balanced menu. Breakfast, lunch or dinner, she’s got you covered. 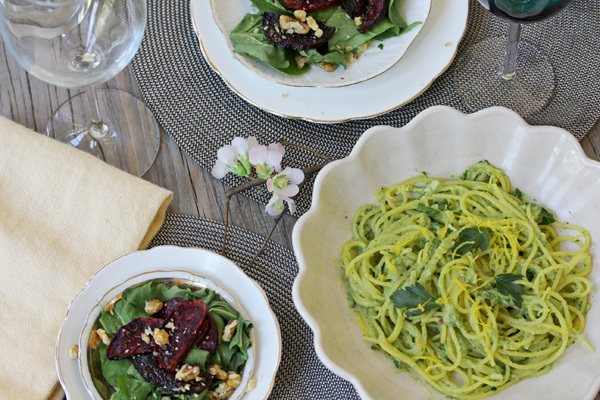 If you don’t have dinner plans tonight, this creamy avocado pasta and beet salad is amazing. You can easily fool picky eaters at home by not mentioning that the sauce avocado based – they’ll never know. And just to top it all off, this fancy plate is actually easy to make. Go grab some gluten-free noodles and get cooking. Bon appetit!